What was Al Gore doing in Chennai? Former US vice president and Nobel Peace prize winner Al Gore compares the importance of the heart in the human body to that of the Earth in the ecosystem at a meeting of cardio thoracic surgeons in Chennai. Shobha Warrier listens in. 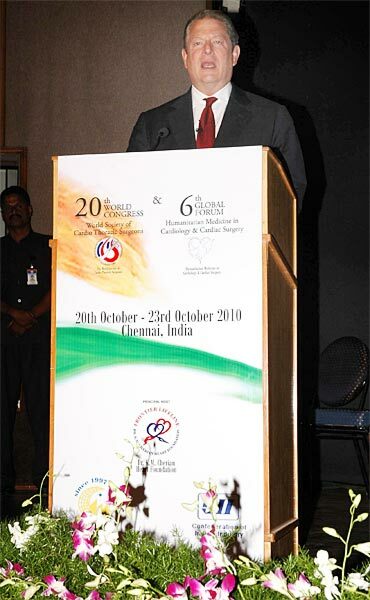 Al Gore, who George W Bush defeated in America's most controversial presidential election in November 2000, addressed an unusual gathering in India -- the World Congress of the World Society of Cardio Thoracic Surgeons -- in Chennai. Eminent cardiac surgeon Dr K M Cherian and his Frontier Lifeline Hospital hosted the event. Gore, who won the 2007 Nobel Peace Prize along with the Intergovernmental Panel on Climate Change, headed by Indian Dr Rajinder Kumar Pachauri, spoke on, not surprisingly, Thinking Green. "The role of the heart in pumping blood to the entire body is like the hydrological cycle of the Earth because what we have is a planet entirely dependent on water," Gore observed. "In fact, the reason why we have been experiencing fluctuating temperatures and floods around the world is because the ecological system has been disturbed. It is like getting a heart disease." Al Gore felt the world's population would stabilise once the planet saw low birth rates, low death rates and small families. "Education of girls is the single most important step in this direction," he said. "Empowerment of women is another and also making fertility measures available to all." Before Gore addressed the audience, Dr Cherian took the podium and said people asked him what Al Gore was doing at a cardio-thoracic conference? "Many forget that 2010 is the year of Global Green -- the motto of the United Nations Environment Programme. But it has nothing to do with the World Congress of Cardiac Thoracic Surgery," said Dr Cherian. "We requested Al Gore to deliver the thematic oration to show the concern we, as a small institution, have for environment." 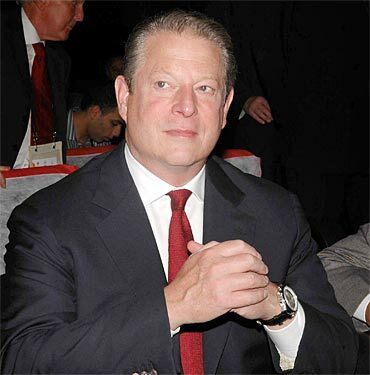 Al Gore's amazing $100 million makeover!